Karen Pagington sent in the following column. My granddaughter Ashley has marched as a member of Memphis Sound for the past two years, and this year was the corps' guard captain. In the six years that she has been in a band, we have missed only one competition. We've also attended shows during every one of her five years of winter guard. My husband is close to 69 and I am almost 65. He has worked all of his life and is now working part time so we can pay for a small 25-foot motor home. We have put off repairs to our house and don't buy some things we need as we really like to watch Ashley and see the smile on her face when her grandpa yells her name to tell her we are there. It takes two days to load the motor home with everything we need for a ten-day tour to watch the competitions. We are not poor, but have to watch what we spend. Taking our food with us helps us save enough to pay for the gas. We started watching drum corps more than 23 years ago when our son (who was in his high school marching band) asked us to take him and a friend to a competition. We attended several competitions, but when he was no longer in band, we stopped. Our granddaughter decided to quit dance after studying it for 10 years when she started high school and wanted to do guard instead. Since I also dance, this made me very unhappy. But, after going to several of her competitions, we realized how much we missed it. Every year the guard went to the Drum Corps International competition in Murfreesboro, Tenn., and we went with them. We were back to watching drum corps again. Ashley decided two years ago that she wanted to march as a member of her hometown corps, Memphis Sound. Last year we were able to go to eight of their competitions and this year we went to 11. We adopted an older dog two years ago when she was eight years old and she travels with us. Molly is a border collie mix and she loves it when the kids and staff pet her. I turned around during one competition and there was a man petting her. He was a staff member of another corps. He didn't say a word—he just knelt down, petted her and then left. The kids that come over to pet her all say the same thing, "We miss our dog." 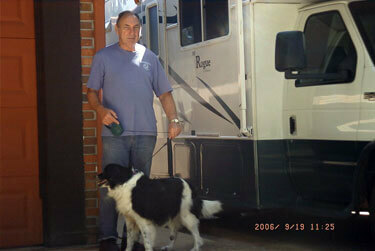 Grandpa with Molly outside the motor home.